Put your career on the fast track! Solano Community College is offering an Industrial Biotechnology Intensive Summer (IBIS) Boot Camp through our Biotechnology Department. 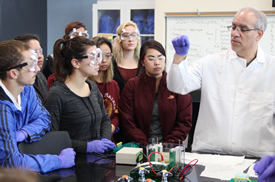 It's a 10-week program that allows you to complete four core Biotechnology courses that can be used to earn either a Certificate of Achievement or to catch up on the required classes to enroll in SCC’s Biomanufacturing Bachelor's degree program. Biotechnology is the use of living systems and organisms to develop or make products that are useful to humans and to our entire planet. Health, agriculture, biofuels, defense, and even criminal justice (which uses DNA fingerprinting, a biotech process, in forensic investigations) all have aspects of biotech leading the way to future opportunities. Biotech started in the San Francisco Bay Area and the region is still home to the largest number of biotech companies in the world who are eager to recruit and hire talented, trained employees into careers with potential for growth and great salaries, starting right now. Completing IBIS could lead to either a Certificate in Industrial Biotechnology, a certificate in Biotechnology Laboratory Assistant, or to an Associate of Science degree in Industrial Biotechnology. These are dependent on whether you have already completed general education requirements. See the SCC catalog for coursework requirements. The IBIS Boot Camp is also a way for Biomanufacturing bachelor's degree majors to gain hands-on experience working in a simulated, quality-control facility, gaining even more skills. The Certificate and the Associate degree fulfill many top Biotechnology employers' requirements for entry-level positions as lab technicians. Students have also found great success in obtaining positions after completing IBIS. Of the 28 students who completed the IBIS Boot Camp in 2015, 26 immediately found jobs in the industry. The IBIS Boot Camp is taught by a diverse group of faculty who bring a range of industry experience, including manufacturing, education, research, healthcare, and biopharmaceutical. You will study in an inclusive environment where you are encouraged to learn from other students while building a strong support network. IBIS will take place during the Summer term only. Specific course dates and times will be posted in Spring 2019. Registration dates will be posted in Spring 2019. Spend 10 weeks learning about revolutionary technologies and open the door to exciting, well paying, cutting-edge careers!